Plate tectonics is a quantitative, robust and testable, geologic model describing the surface motions of Earth's outer skin. It is based on real data and assumptions, and built using the scientific method. New space geodesy data provide important quantitative (and independent) tests of this model. In general, these new data show a close match to model predictions, and suggest that plate motion is steady and uniform over millions of years. 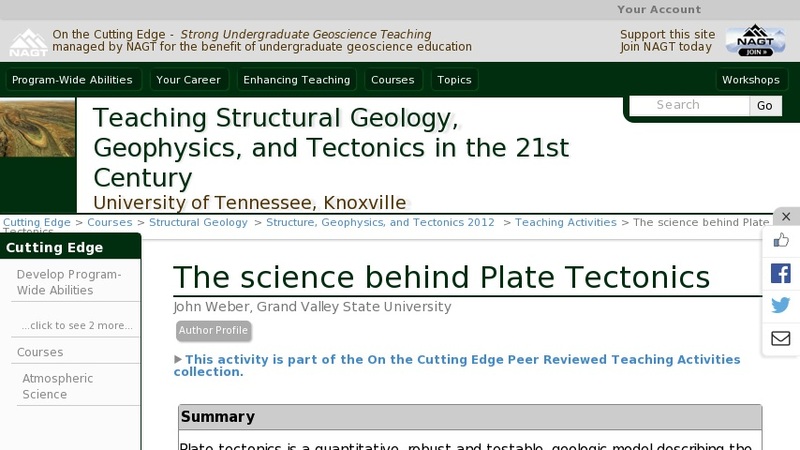 Active research continues to refine the model and to better our understanding of plate motion and tectonics. The exercise presented here aims to help students experience the process of doing science and to understand the science underlying the plate tectonic theory. Key words: plate tectonics, global plate motion models, assumptions, geologic data (spreading rates, transform fault azimuths, earthquake slip vectors), space geodesy tests.